Tivoli Évora Ecoresort is in a privileged location just a few miles from Évora, a World Heritage city and just an hour's drive from Lisbon. This 4-star eco-friendly hotel offers the ideal conditions to escape from the daily routine and spend a family getaway or for a quiet and restful stay whether it's for business or leisure. 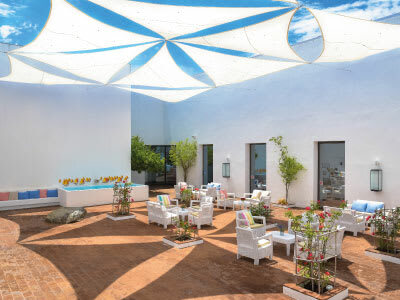 Integrated into the Alentejo landscape and built based on strong environmental concerns, this luxury hotel in Évora, Portugal, focuses on sustainability and energy efficiency. Our Tivoli Évora hotel has a modern design with a contemporary and relaxing atmosphere that offers what is needed for an unforgettable stay. Discover our Cardo restaurant & bars where you will find a menu full of Mediterranean flavours and traditional Portuguese cuisine that will help you enjoy a unique wine and gastronomic experience. The Tivoli spa has a circuit of treatments and steam rooms, Turkish baths, an indoor pool and a gym to surprise yourself with moments of genuine well-being. During those hot summer days, take time to relax in the outdoor swimming pool near the stunning Alentejo mountain at our magical Tivoli Évora Ecoresort. With excellent size, the suites are decorated with modern furniture. The contemporary atmosphere and the raw tones blend in with the surrounding area, bringing the calm and relaxation needed for a good night's sleep. The 56 individual suites arranged in villas, all on the ground floor and with about 70 sqm. each, also have a private terrace and all the necessary equipment for a comfortable stay. Tivoli Évora offers you a restaurant and a snack bar. With an authentic cuisine that carefully selects regional and seasonal products, indulge yourself in the Cardo Restaurant. In addition to a unique wine and food experience, at the restaurant you can enjoy the view of the Alentejo mountain. If you wish to have a lighter meal, you can also have the snack bar options with typical Portuguese snacks. With a splendid view of the Alentejo mountain range and in perfect harmony with the surrounding nature, the outdoor swimming pool is the perfect peace retreat for the hottest summer days. Enjoy a swim or indulge yourself in a cocktail whilst enjoying the beauty and tranquillity of the countryside. For colder days, or for total relaxation, enjoy the comfort and unwind in the indoor pool. Among cork oaks, holm-oaks and olive trees, Tivoli Évora is the cork's first hotel in the world. With a great focus on sustainability and energy efficiency, part of the electricity used is produced through photovoltaic panels. The heating of the central building, swimming pools and water is made through geothermal and solar energy. Certified as ECO-Hotel, also has Environmental Certification, ISO 14001 and 9001 for Quality Certification. The Tivoli Spa would like to invite you to relax and journey to the next level on a timeless spa experience, where an inspiring and serene environment will ensure a unique well-being adventure. Innovative techniques are combined with holistic therapies in rejuvenation treatments and specialised massages in four different treatment rooms.